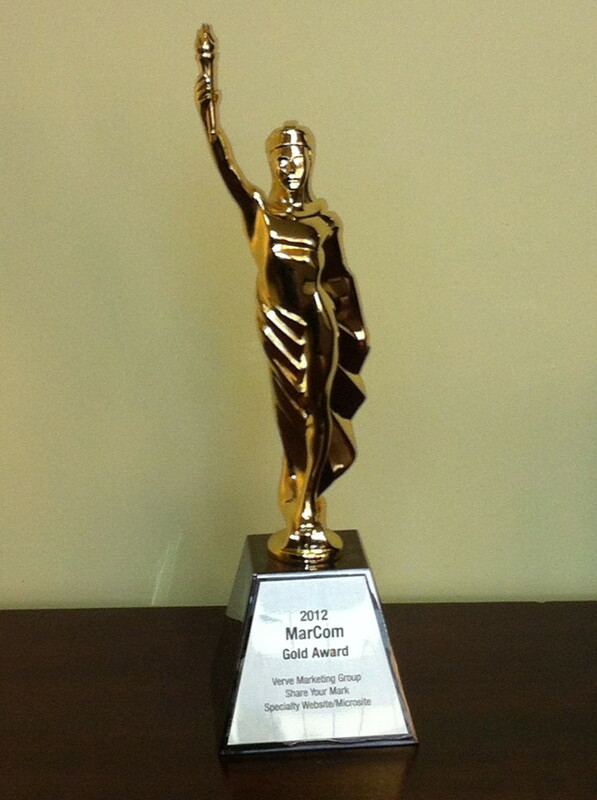 CHICAGO – Verve Marketing Group is pleased to announce it has been named a Gold Award winner in the 2012 International Marcom Awards competition. The agency garnered the award in the Specialty Web/Microsite category for ShareYourMark.com, a social sharing site created to help promote What’s Your Mark, a spring 2013 book release by celebrity photographer Jeremy Cowart’s. “It’s the type of site we like being known for – great design and cool use of technology,” commented Joan Begitschke, Marketing and Brand Strategist at Verve. The MarCom Awards is an international creative competition administered by the Association of Marketing and Communication Professionals. Over 6,000 entries from throughout the United States, Canada and several other countries were submitted for the 2012 competition. The Gold Award is presented to those entries judged to exceed the high standards of the industry norm. Verve Marketing Group is a creative and strategic communications firm located in Chicago helping organizations move brands with well-designed, strategically-driven creative. The agency’s success grew out of a business model to provide “big agency talent and deliverables without big agency fees” for organizations who value good thinking and well-executed creative in order to get the most from every marketing dollar. The team delivers difference-making digital and print communications including custom web development, digital advertising, and print.